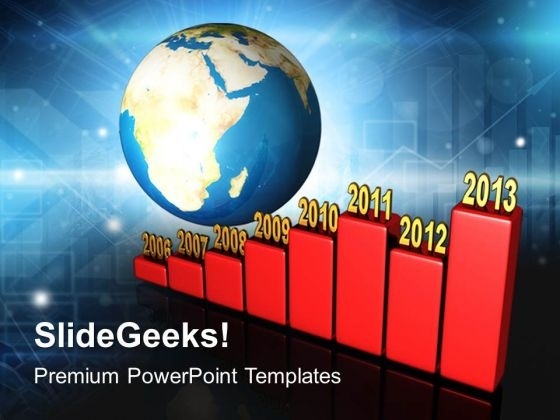 Bar Graph Yearly Along Earth PowerPoint Templates And PowerPoint Themes 1012-This PowerPoint Template shows the Annual growth Chart from 2006 to 2013 in the Graphical manner. It imitates the concept of Money, Business, Profit, Loss etc. Use this Template for Increasing and decreasing Bar Graph. Clarity of thought has been the key to your growth. Use our templates to illustrate your ability-Bar Graph Yearly Along Earth PowerPoint Templates And PowerPoint Themes 1012-This PowerPoint template can be used for presentations relating to-"Bar graph showing the growth of profits, business, finance, success, earth, globe" Our Bar Graph Yearly Along Earth PowerPoint Templates And PowerPoint Themes 1012 will blow your ideas. They will fan out across the audience. Develop their faith with our Bar Graph Yearly Along Earth PowerPoint Templates And PowerPoint Themes 1012. Your thoughts will make believers of them.